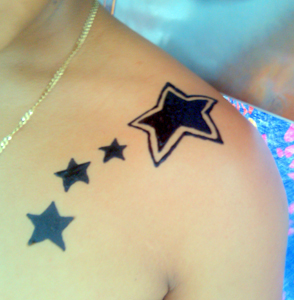 The designs will look good for 1 to 2 weeks, fading gradually within that time. Factors determining this are the depth of the stain, the particular body area chosen, and how much that area is exposed to water, chemicals and rubbing. 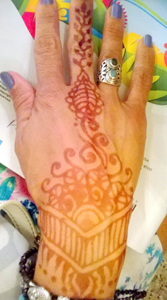 What is the color of the Henna stain? After the paste comes off, the stain color ranges from orange to a darker reddish brown. 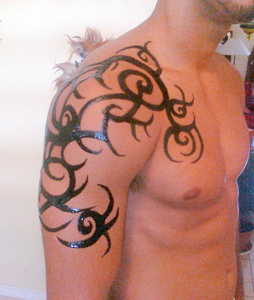 Darkness depends on the area of the body treated, the quality of the powder, the quality of the application and how long the paste is left on. 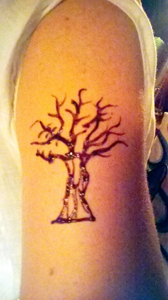 Also, hands and feet stain the darkest. 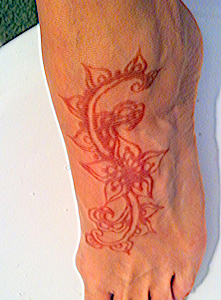 Henna alone does not produce a black stain. 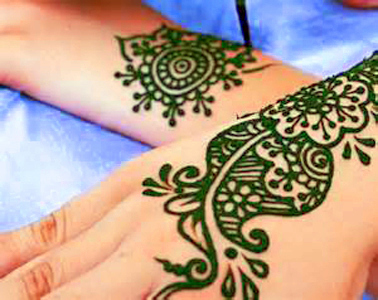 There are several authentic additives or mixtures that give a black-dying henna, especially in North Africa. 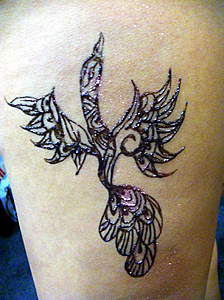 We now offer a very safe Black Henna for the skin! 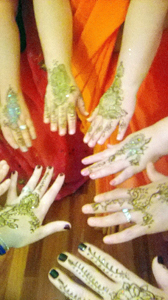 Why do many photos of Henna look black? 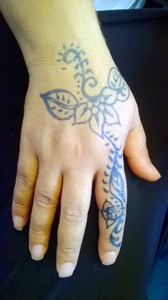 These photos were taken with the henna paste freshly applied or still on the skin. When the paste is removed after 6 to 12 hours, the stain color is orange or reddish brown. The length of a sitting ranges from 10 minutes for a simple design to several hours for a large body area painted with a intricate design. Though in some cases the painting it self may only take 10 minutes, the paste needs to be preserved with lemon sugar solution which the artist applies after the paste becomes firm on the skin. 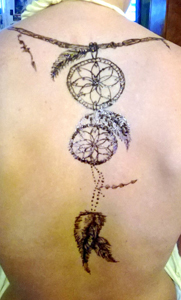 Unlike tattoos, henna does not hurt because there are no needles used and no skin is broken. 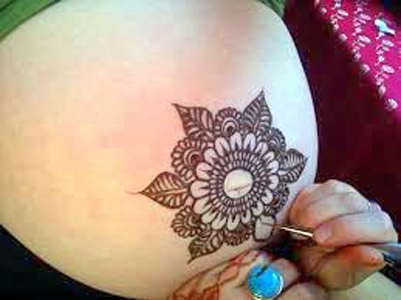 Henna is applied to the top of the skin, and many people enjoy the coolness of the paste as it is painted on and the further cooling of the lemon sugar solution. 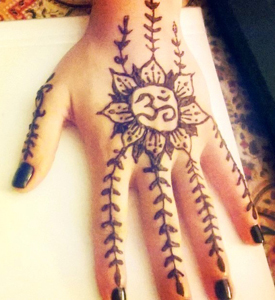 Henna is a soothing mixture and conditions the skin. 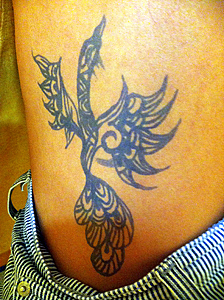 Henna does not stain black.for those who want to have a deeper stain for there the tattoo, the only safe product to use to stain black or blue for a tattoo ink look is Jagua which is completly natural base and comes from a brasilian fruit called genipa americana used for hundreds of years by amazon Indians to make temporary tattoos. 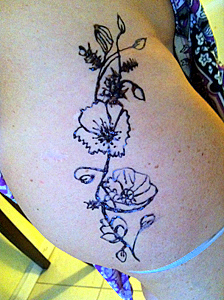 it last a little longer maybe than henna but only on certian area henna doenst stain well like torso, lower back, neck, otherwise they also will last 1-3 weeks depending on client.